(Photo courtesy of Vestar) Architectural rendering of the Union Pacific Hotel, scheduled to open at The Gateway in 2021. Plans are taking shape for an eight-story, 225-room hotel at the site of the Union Pacific Depot in Salt Lake City’s Gateway mall. If approved by city leaders, construction will begin on the Union Pacific Hotel in summer 2019, with an opening in 2021, according to Jenny Cushing, vice president of leasing for Vestar, The Gateway’s owner. Plans submitted to Salt Lake City include the renovation of the depot and its Grand Train Hall to house the hotel’s reception areas and main entrance. 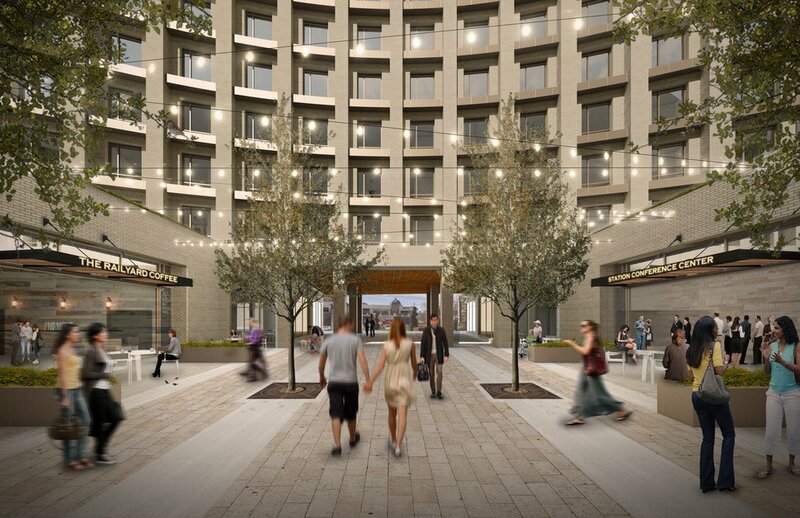 The ground floor structure will also include a bar, restaurant and retail space, with the addition of a coffee shop and exterior courtyard between the depot and a to-be-built curved tower located at the top of the steps leading the The Gateway’s Olympic Legacy Plaza. 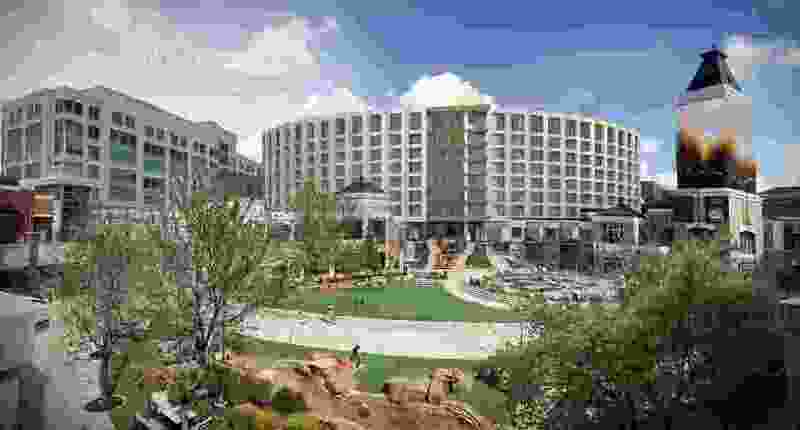 Cushing said the hotel is part of Vestar’s strategy to transform The Gateway into an entertainment and lifestyle destination. Since acquiring the property, The Gateway has added a Wiseguys Comedy Club location and opened the state’s first Dave & Buster’s franchise. She said The Depot, a music and performance venue in the northern wing of the Union Pacific Depot, will remain and be incorporated into the design and operations of the hotel. “We’re very optimistic that both the administration and the residents of Salt Lake City are going to embrace the caliber of product that we’re planning to deliver to the market,” Cushing said. 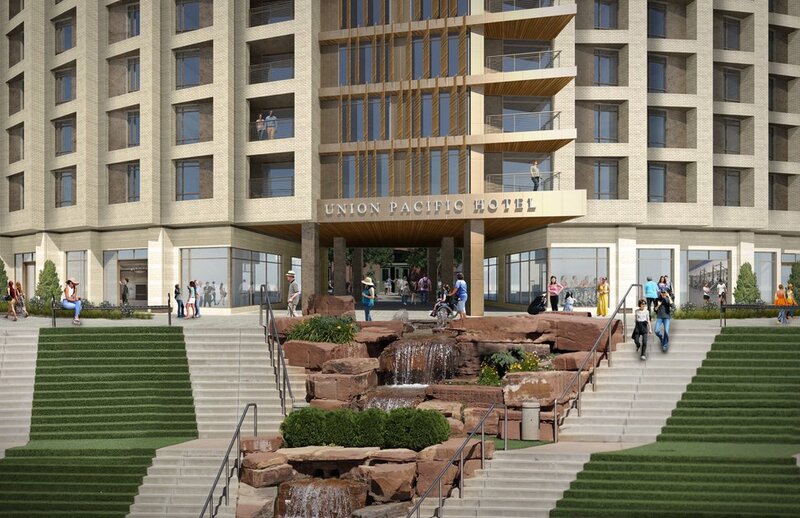 (Photo courtesy of Vestar) Architectural renderings of the Union Pacific Hotel, which is scheduled to open at The Gateway in 2021. 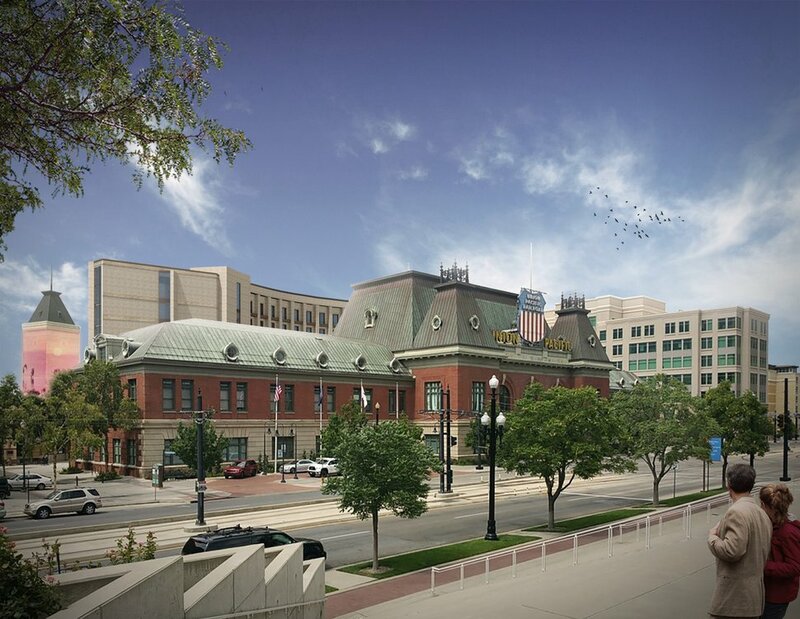 Because the hotel exceeds height restrictions for the area and alters a historic structure, the project requires approval from the Salt Lake City Planning Commission and the city’s Historic Landmark Commission. Molly Robinson, a planning manager with the city, said public input on the proposal will be sought by the city commissions next month, ahead of initial consideration. If both panels sign on, Robinson said, Vestar will be able to develop its plans and apply for a building permit to begin construction.